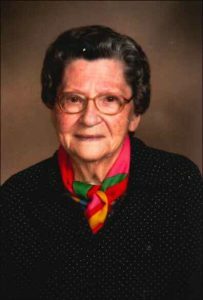 Beatrice "Bea" Mastera, 98, of David City, died Saturday, December 3, 2016, at the St. Joseph's Villa. Mass of Christian Burial Saturday, December 10, 2016 10:00 A.M.
Beatrice M. (Svoboda) Mastera, 98, of David City passed away on Saturday, December 3, 2016 at the St. Joseph's Villa. She was born in Brainard on October 27, 1918. She was preceded in death by her parents John F. and Anna K. (Sypal) Svoboda, her eight brothers, John, Theodore, Rudy, Ray, Henry, Frank, Albin and Joseph Svoboda and her two sisters, Anna Horacek and Adeline Kudlacek. Bea and Alfons Mastera were married on January 24, 1940 at Holy Trinity Catholic Church in Brainard. Alfons preceded her in death on August 3, 2009. They were blessed with and survived by 4 children, Arthur (Susan) Mastera of Aurora Colorado, James (Georgianne) Mastera of Lincoln, Robert (Debra) Mastera of Lincoln, Virginia (Larry) Geiger, 11 grandchildren and 17 great grand children and 6 great-great grandchildren. .Bea was the youngest of 11 children. She was a loving and loved mother, grandmother, aunt and friend to many. She and Al lived on a farm for 32 years where Bea gardened, canned, baked kolaches, milked the cows and raised chickens. She worked for 22 years as a cook at Aquinas High School. During retirement Bea spent many hours crocheting blankets for all her children and grandchildren. Bea and Al later moved to St. Joseph's Court. After his death Bea resided at St. Joseph's Villa. She remained there until her death where she was surrounded by her children.